Space Trends is an annual publication by Eurospace. It is a unique report providing a large amount of data and information in a very synthetic and graphic manner. It is an essential tool for all actors of the space sector to quickly understand the situation of global space activity and the major trends of recent years. This report presents historical statistical analysis global space activity (1957-2015) from different perspectives: launches, missions, customers, manufacturers, markets… In each case, charts and graphs are the focus of the publication. Enabling our reader to quickly dig deep into the details and understanding of every situation or market segment. Space Trends provides ONLY quantitative information on spacecraft launched and launcher used in both mass and number series. For some specific areas (such as Space Telecommunications or Human Spaceflight, e.g. ), the basic indicators are completed by specific ones: number of transponders, bandwidth, spacecraft bus, launcher families, launcher reliability, mass classes, etc. 5th edition – Space Trends 2016- NOW AVAILABLE! Following the great success of the Space Trends previous editions, Eurospace is proud to propose you the 5th edition of Space Trends. This edition has been fully revisited and the layout and contents of the document have been expanded to provide our readers with the most complete and detailed analysis of our database: LEAT (Launch Events Analysis Tool). Charts and graphs are increasingly the main focus of the publication, rather than text. With more than 500 graphs, the 5th edition provides a complete document to study, understand and dig into details of every space situation or market segment. Also, for first time, you can purchase Excel data sets for each series of graphs. If that should be your case, please contact letterbox@eurospace.org for details. The report, which has 675 pages in total, is split in 8 volumes, with the first volume dedicated to the historic global trends from 1957 to 2015. The other volumes address specific segments of space activity, such as institutional markets, human activities, launcher activity etc. during the period 1996-2015. 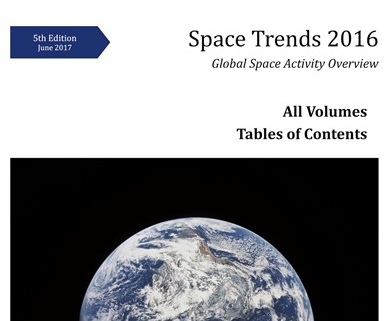 For a detailed description of the contents of each volume, download the Space Trends 2016-Leaflet here, and/or download the complete Table of Contents here. Space Trends 2016 volumes can be bought all together (Space Trends 2016 bundle) or separately. Please notice that Space Trends 2016 volumes are sold with a single user license. In order to get a corporate of commercial license contact Eurospace. Also, while using Space Trends 2016,please keep in mind our Eurospace copyright policy: please read our terms. Eurospace copyright policy: please read our terms. Eurospace members benefit from a 50% discount on the Space Trends 2016 Bundle (all volumes). To do so, please contact Eurospace to get your Eurospace Member Coupon Discount that you can use in the merchant site.